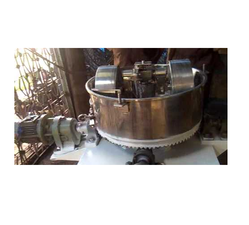 For mixing of foundry chemicals, pastes, molding stand, foundry fluxes, food colors etc Edge Runner Machine is excellent where an amount of binder of agglomerate is to blended into the material. Also used for identification of the mix. The pan is stationery inside which rotate duty millers/rollers. The heavy wide rollers ride over the material where intensive crushing, shearing, and mixing action takes place. Scrappers and ploughs are provided for directing the mass into the path of the rollers. The machine is also available with granite rolls and pan.